A region unsurpassed in beauty, take a camping holiday in the great outdoors and fill it with adventure, culture and gastronomical wonders! The region is not only famous for its landscape, but is also steeped in history. The aquaduct of Pont du Gard and amphitheatre and temple in Nîmes are magnificent examples of Roman architecture. Estaing is one of the prettiest medieval villages in France, and is only one of many worth visting. With direct access to the lovely La Ligne River and its lagoon, this is a magical place to bring the family. Excellent on-site facilities for all ages, combined with unlimited possibilities for off-site recreation and sightseeing make Les Ranchisses the definition of luxury camping. Explore the rivers of the Ardèche by canoe or cycle along the many riverside trails. Located near the Chassezac River, this campsite is bursting with family-friendly activities and entertainment. Take to the countryside and experience local life in the many charming towns of the area. Fittingly situated near the delightful village of Joyeuse, and with the La Beaume River just 100m away, treat the family to a holiday brimming with adventure on land and water. 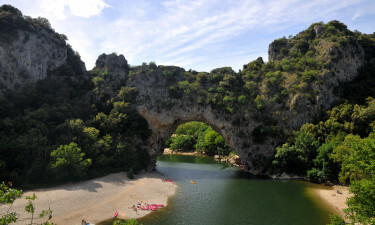 Why not discover the southern Ardèche by horseback or take to one of the many rivers or lakes. 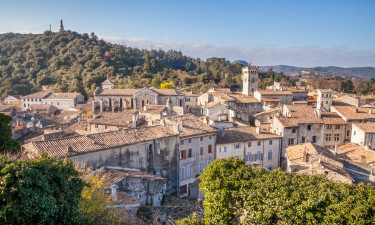 From the Palais des Papes in Avignon to the artistic treasures of the Musée des Beaux-Arts in Lyons, the regions towns and cities offer a mesmerizing visual feast to hungry visitors. For gorgeous chateaux, try Espalion, Estaing and Montélimar. Famous for its Romanesque art, the medieval village of Conques, where the Rivers Dourdou and Ouche meet, is another exceptionally beautiful destination. Discover an unspoilt wilderness teeming with fauna and flora in the Parc National des Cévennes. Marvel at the awe-inspiring caves of the Grotte de la Madeleine. Take a walk in the petrified forest of Le Bois de Paiolive. When it comes to beaches, each turn of the river leads to a new discovery. From paintballing in Aubenas, to the volcano theme park of Vulcania in Saint Ours-Les Roches, there is no shortage of attractions to keep the kids entertained. Adventure seekers rejoice! For wild swimming, hiking, mountain biking, climbing, canoeing, rafting and fishing, the mountainous terrain and network of rivers and lakes are a dream come true. The climate of the Ardèche and Auvergne is continental. For warm and sunny days, the best months to come are May, June, July, August and September. Temperatures vary in relation to altitude, so mountainous areas are naturally wetter and colder in winter. The average temperature in summer is 18°C and 3.5°C in winter. The rural landscape has shaped the region’s cuisine, with pork dishes a particular speciality. 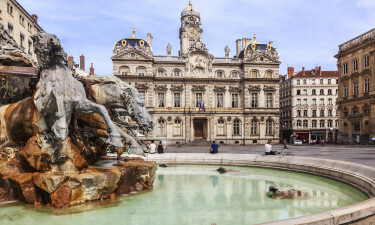 Lyon is famous the world over for its museums and gastronomy. Take a wine tour here and discover the regions of North and South Côtes du Rhone, Beaujolais and Burgundy.